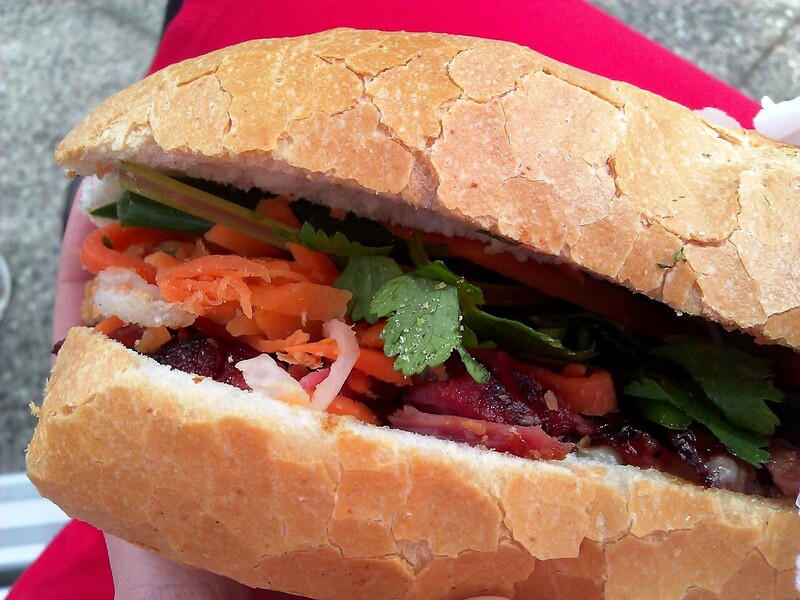 It seems that we're on a mission to try all the Vietnamese restaurants in the area! 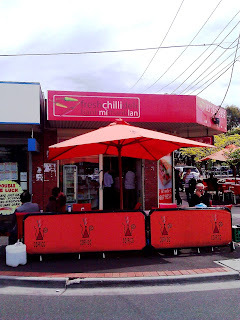 Price: ~$10 for most rice or noodle dishes, there is also a full takeaway menu online, which looks pretty much the same as the instore menu. Tomato rice with crispy skinned chicken - I've been having such delicious crispy chicken dishes that this was really disappointing. I think you can tell a lot by looking at a dish. Even though it looks colourful and interesting, from here you can imagine how the skin was crispy and nice, but the meat was hard and dry. I'm sure it was reheated, and it was also quite bland. I squirted a large pool of chilli sauce from the condiments to accompany the dish. 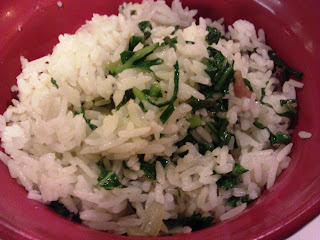 Rice was unpleasant too - not hot, with grains in a state where it wasn't soft enough to stick, but wasn't dry or uncooked either. Tomato rice with spicy pork rib - again, the flavouring wasn't tasty. The chilli taste didn't even touch the dish, unless you specifically went to eat the chilli pieces themselves. When you have deep fried ribs, knowing it's unhealthy, you want it to taste good. But it doesn't. The crisp wasn't a light crunch, but a really solid hard dryness. Meat wasn't tender either. Other: I wrote last time about how there are two types of these restaurants - those that have clean, colour coordinated, modern looking interiors and those that are rather messy, with clashing colours. This place definitely belonged to the first type - in fact we walked in because it looked nice and comfortable. Rating: 1.5/5 yet looks can be deceiving. Yuck. 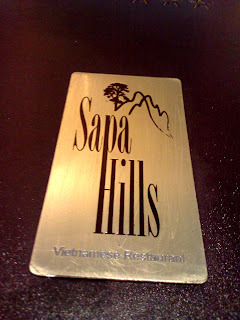 Sapa Hills had terrible food (rarely do I say that about the Vietnamese food in Footscray!) and for a $10 meal I prefer good food over good environment. Besides, you can often find places where both coexist! Looks like this post is coupled with the previous post not based on cuisine type, but on low ratings. 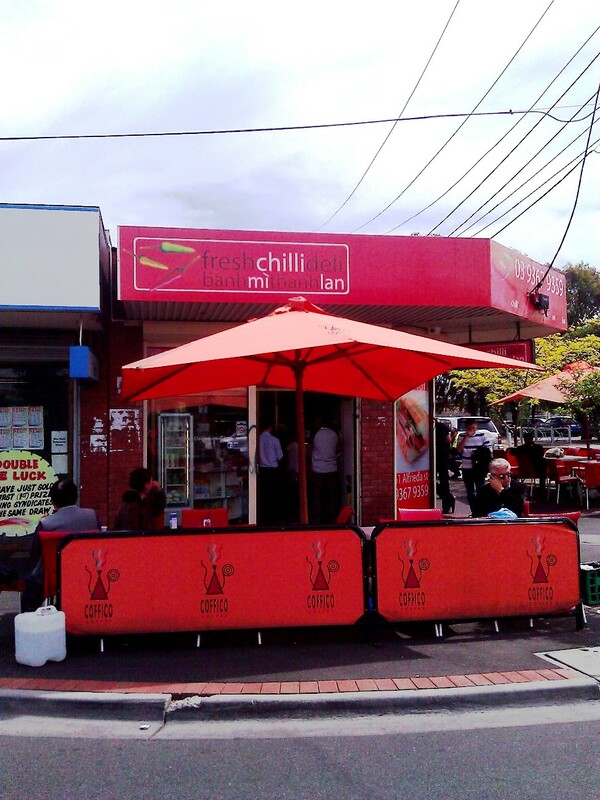 This seems to be a favourite lunch spot for my church group who go to lunch together after service every other Sunday or so. Website: the official website is informative, with a whole menu of items you can order online and have delivered, or pick up in person. Food: my apologies for less than ideal phone photos, but I will assure you that in this case, the food did not actually look any more appetising in real life. Shanghai fried pudding (上海炒年糕) - served with shredded pork, mushrooms and buk choy. 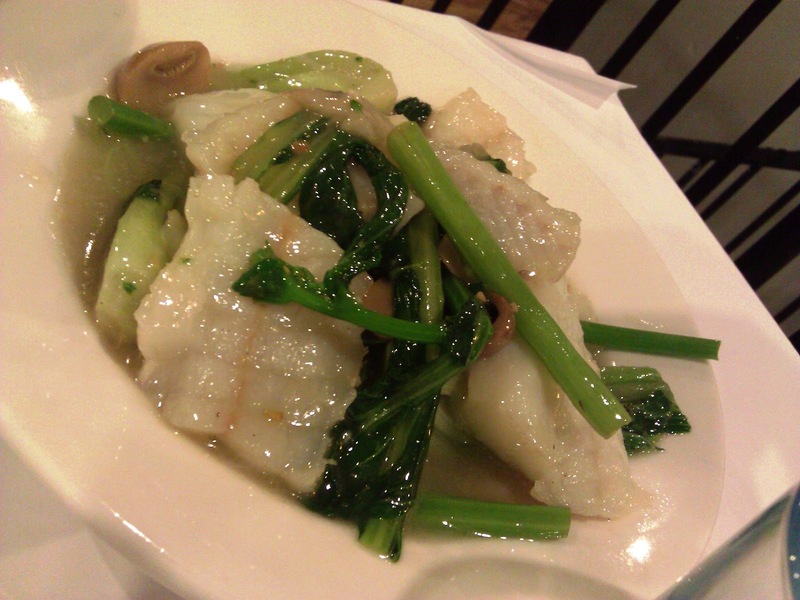 On a previous occasion I also tried the vegetarian version of the dish with spinach and bamboo shoots. The ingredients individually were fine. Rice cakes were of a good texture - chewy, soft and in distinct slices (often they can stick together in clumps when you cook them). Vegetables were fresh, there was plenty of shredded meat and mushrooms. However, the flavouring was salty and colour was wrong. Maybe it depends what you grow up with but in Shanghai, rice cakes had always been white and soy sauce was not used as the main seasoning. Also, I can't pinpoint it but there is something wrong about the general taste of the dish - I suspect it has something to do with reused oil which tastes stale and tainted. Rice cakes (年糕) is made of glutinous rice paste and has a soft, chewy, and slightly sticky texture. 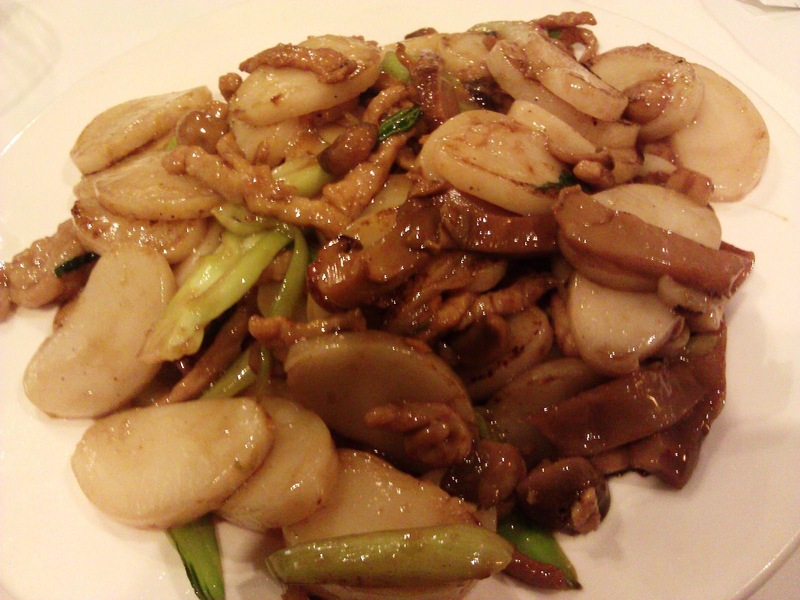 Often, when we talk about rice cakes, my friends from Malaysia / Singapore / Hong Kong think of the Cantonese-styled pan fried sweet brown rice cakes, which are popular during Chinese New Year. 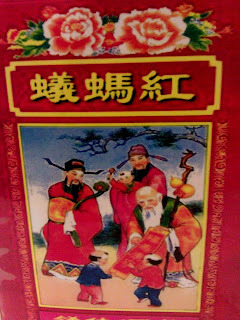 There are sweet white rice cakes too. However, in mainland China, 年糕 would most commonly refer to savoury rice cakes which are eaten throughout the year, stir fried with vegetables and shredded meat, or with the same ingredients in a soup (similar to noodle soup). Both fried and soup rice cakes are one of my favourite foods to eat and cook, and I also look forward to having it every time I visit Shanghai! Crispy fried egg noodles with beef - the vegetables were surprisingly fresh and well cooked, and the beef was tender. But unlike the delicious crispy noodles at Thuan Phat, these noodles were firstly often burnt on the bottom, and secondly easily soaked up the gravy so that it would become soft within minutes. This had an unpleasant greasy taste too. Minister chicken - "chicken spare ribs lightly battered and tossed with spicy sauce". Comes with rice. This seems to be a favourite, a third of the group ordered this. I would rewrite the description as heavily battered, and soaked in a sweetish, dark vinegar, spicy sauce. Which is rather tasty, but way too salty and overpowering. Sliced fish with vegetables - basa fillet, healthier option, nothing much to say. 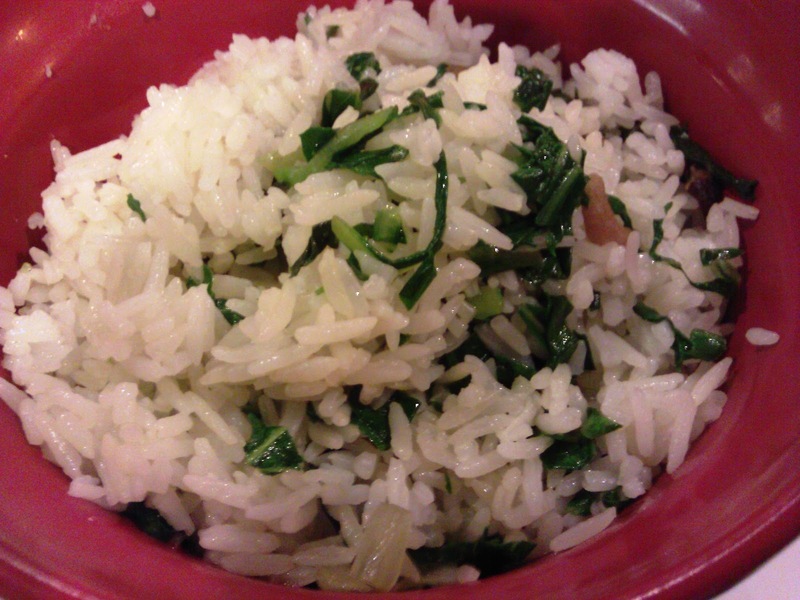 Rice - according to my fellow diners who frequent Ants Bistro, you can have a free upgrade from plain rice to vegetable rice! 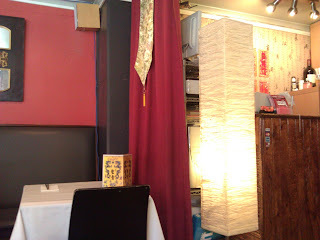 Other: traditional dark red colours are used for walls and curtains, the tables are covered with white tablecloths and (white butcher) paper. 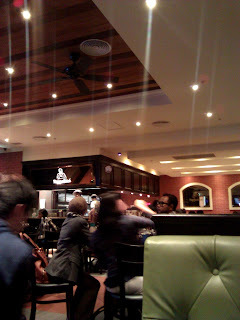 Lighting is slightly dim, depending on where you are seated. There is a spacious upstairs dining area. Service is pleasant enough. Rating: 1/5 I would never come back on my own accord. The dishes are terrible, are poorly flavoured, overly salty, and all permeating with a dirty oily taste. There is a good reason why during what should be busy weekend lunch times, this place always has plenty of space to accommodate our large groups of nearly thirty people! I recommend you actively avoid it too, because there are numerous surrounding restaurants which serve authentic, delicious Chinese cuisine. Usually I end up only reviewing places which I feel are worth writing about. I enjoy rather than criticise most meals, and with limited time I don't write about every dining experience. Plus, writing about bad food is dry and uninspiring, and I believe it reflects poorly on a reviewer to use the anonymity of the net to vent their frustration at restaurants, ranting on with unhelpful hateful comments. But, I will say that Ants Bistro definitely shortlists on my "top terrible Asian restaurants" list. 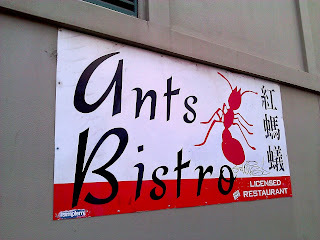 I really dislike this place, along with Your Thai and Ajisen Ramen in Melbourne CBD, and China Bar (which is now China Style) and Mark's Place (which is now closed) in Carlton. After more than a year, I've finally revisited my favourite Korean restaurant. Please excuse me for grainy quality photos from the old camera, and my inability to remember details of the dishes from last year. Location: 51 A'Beckett St, Melbourne - between Swanston and Elizabeth St. Darac is surprisingly inconspicuous and I've missed it on multiple occasions, despite knowing where it is. Sides - my friend was complaining that they didn't serve the small sides (banchan) that usually accompany Korean meals. In the end we were given this plate of kimchi when he asked for sides. Pork shabushabu sausage stew - $28 (medium, without rice), nicknamed Korean army stew (budae jjigae). We wondered whether this was a popular dish in the Korean army, but turns out that the dish originated after the time of the Korean war; out of limited supplies, Koreans created a fusion between traditional flavours and ingredients given by the US army, such as sausages and spam. Every time I have this, I love the spicy, rich flavours of the stew, and how deliciously it accompanies a plain bowl of rice. On the bottom of the pot, there is a generous mound of hot pepper paste for the soup base (gochujang - a sweetish, red chilli, fermented bean paste commonly used in Korean dishes and readily available at Asian groceries). 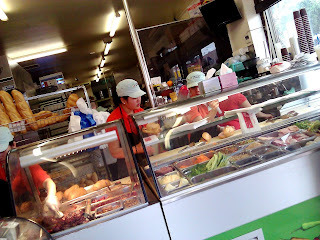 As you can see, other ingredients included a variety of sausages and spam, macaroni, soft tofu, kimchi, zucchini, rice cakes, Chinese cabbage and cheese. I'm no fan of plastic cheese or spam, but they work really well to add flavour to this stew. The pork shabushabu (thinly sliced marbled pork) was tender and juicy, yum. Seafood sausage stew - this is the large sized pot for $36, not sure if it's that much bigger! Prawn salad - $9 "deep fried 3 prawns, green salad with sweet chilli sauce". Crab meat salad - $8 "crab meat on green salad with sweet spicy dressing". Grilled sashimi set 1 - $22 "seared fillets of salmon and eel sashimi prepared on the table". Cool flame torch! Doesn't this remind you of the Bunsen burners in high school science labs? Seafood kimchi pancake - $15 "pancake comprising of fresh seafood pan fried over a bed of kimchi and spring onion". I love Korean pancakes (pajeon) - usually the base comes with a light batter, which becomes soft and crispy when pan fried, and lots of spring onions or chives. Isn't it interesting how similar dishes can taste so distinct? For example, 葱油饼 (scallion pancake) in Chinese cuisine uses similar ingredients but the flour is made into a dough, which makes the pancakes stiffer. Or for お好み焼き (okonomiyaki) in Japanese cuisine, flour and cabbage are used to create a pancake base, seafood or other ingredients are layered in, and the okonomiyaki is topped with a distinct taste of mayonnaise, a BBQ-like sauce, and bonito flakes. Bibimbab - $14 "assorted vegetables, egg and selected item on rice in a hot stone pot served with Korean chilli sauce". Can't remember whether this was chicken, pork or beef, oh well! Bibimbap (or bibimbab, or a variety of other spellings) is one of the first Korean dish I got into, and is probably my default option at Korean restaurants. It's a simple idea, piling meat and various cooked vegetables on top of rice, completing the colours with a bright yellow egg in the centre and bright red chilli sauce. Simple, but it's delicious and I especially enjoy it in those hot stone bowls which keeps the dish hot for the whole meal, and makes the rice on the bottom dry and crispy. It's like the perfect fried rice, with plenty of what Chinese people call 锅巴 (scorched rice). The interiors are typical of a Melbourne brunch cafe, with exposed interiors and cute but quirky decorations. For example, near the counter there is a moose head made of white carboard slices. Water was served in what looked like ceramic watering cans! Rating: 4.5/5 always enjoy my meals here, the stew is heartwarming, and I like how the interior design is thoughtfully cute, warm and cozy. Not all items on the menu are really worth ordering though; for example the salads, or grilled sashimi sets are expensive for what they're worth. 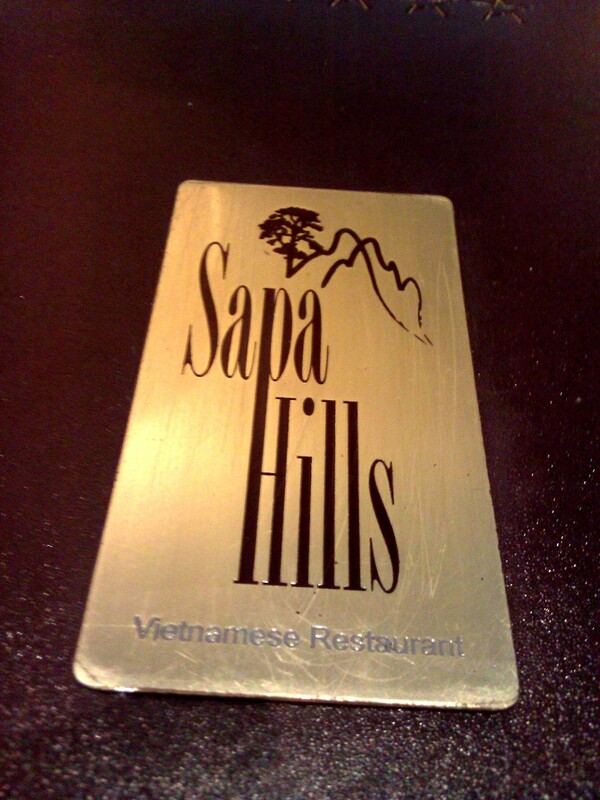 One of these days, I would love to try their $10 lunch menus too! Special addition: one of the decorations Darac uses are instant film camera photos from groups of diners. During mum's "surprise" dinner for me last year, they took one for our group too; keeping one for themselves, and giving us the other copy. To my friend who keeps insisting that my readers have requested a photo of me along with food pictures (which I know is untrue!) here is a deliberately unclear photo of myself and my fellow diners. 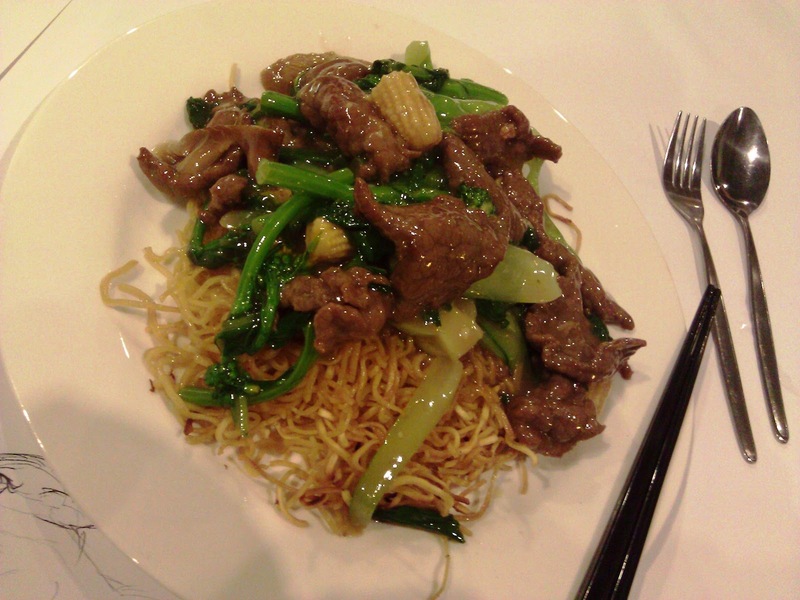 I seem to be coupling similar restaurants of the same cuisine, comparing and contrasting their dishes. Unintentionally though. For the last few posts I've been posting in the order in which I've dined (and I'm not always the one who picks where we go)! Don't you find the name odd for a food establishment - the combination of a father (pappa) and a guy with golden blings, rolling in cash (rich)? Or is it supposed to imply that the restaurant itself is rich and classy? Or maybe founder Rich Tan had all these things in mind, plus of course including his name in the trademark, when he started the business. Website: the official website is quite helpful. For some lovely food photos, see this blogger's review. 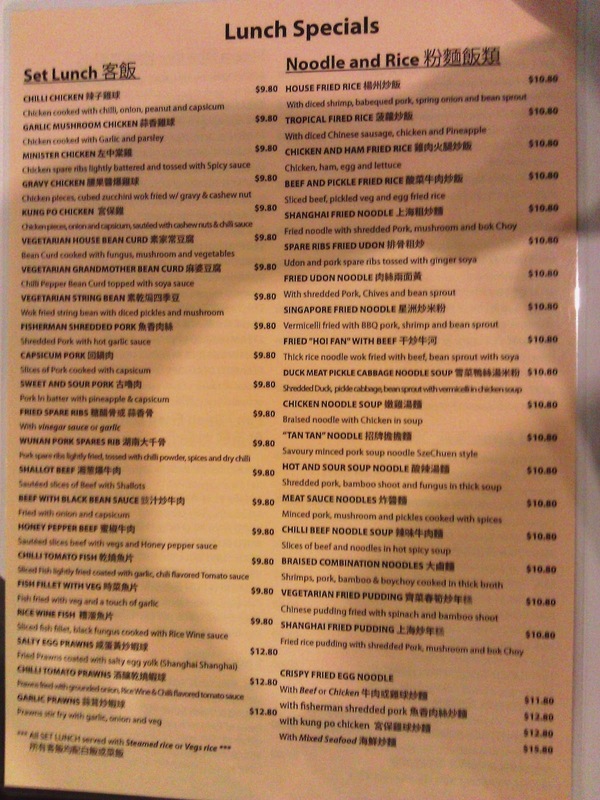 Prices: ~$10 for most of the noodle or rice dishes. 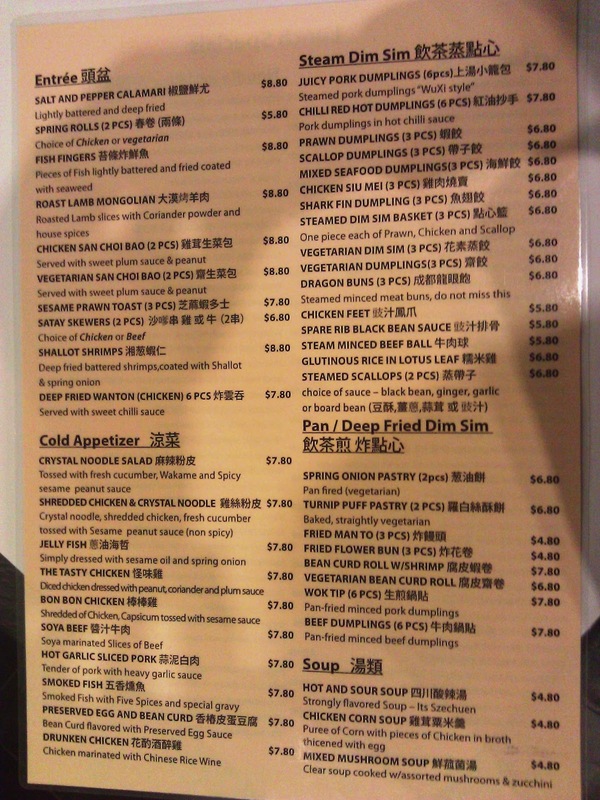 Similar to Mamak, this Malaysian restaurant also has the full menu... but without prices! Roti canai - $5.60 "a fluffy and slightly crispy hand tossed bread". I remember a Malaysian person telling me that the roti canai was his favourite supper/snack at PappaRich - so half a year later when the long lines started becoming shorter, I came back to try it. The first occassion I had this, the roti was fluffy, crispy and hot. But second time round (photo above) it was flatter, just warm, but still with a nice crisp. I personally like the dippings here better than Mamak - the curry sauce was nicer (middle) and the spicy kick from the chilli was enjoyable, plus there was more of it (right). However, the roti canai itself at Mamak does look fluffier and fancier. I wouldn't recommend getting this with chicken as a main for about $10, unless you are after a snack and not a proper meal. The names are somewhat confusing, but roughly speaking roti canai (Malaysia), roti prata (Singapore) and paratha (India) are variations across the region, of flat bread served with or without stuffing and curry sauce. The Indian type seems to be denser in flour content with less layers and crisp, the Malaysian type more rounded, flakier and fluffier, and the flatter square shaped type seems common in Singapore. But I'm no expert on flat breads, or these South East Asian cuisines. There seems to be some hot debates on the internet regarding 1) whether "roti canai" versus "roti prata" is purely a regional name difference, or whether the name conveys something about the way it's made, and 2) which type is better, with some subtle or not-so-subtle Malaysian versus Singaporean sentiments. Curry laksa (chicken) - had this a couple of times and I quite like it. The soup base is quite rich in coconut cream but tasty nevertheless. Curry soup, thick yellow noodles, fried eggplants, tofu, tender pieces of chicken and sprinkled fried shallots - what are a lovely combination of flavours and textures! My favourite laksa place so far in Melbourne would still be Chef Lagenda, I remember the laksa there to be quite amazing but I will have to revisit to remember what exactly made it special. 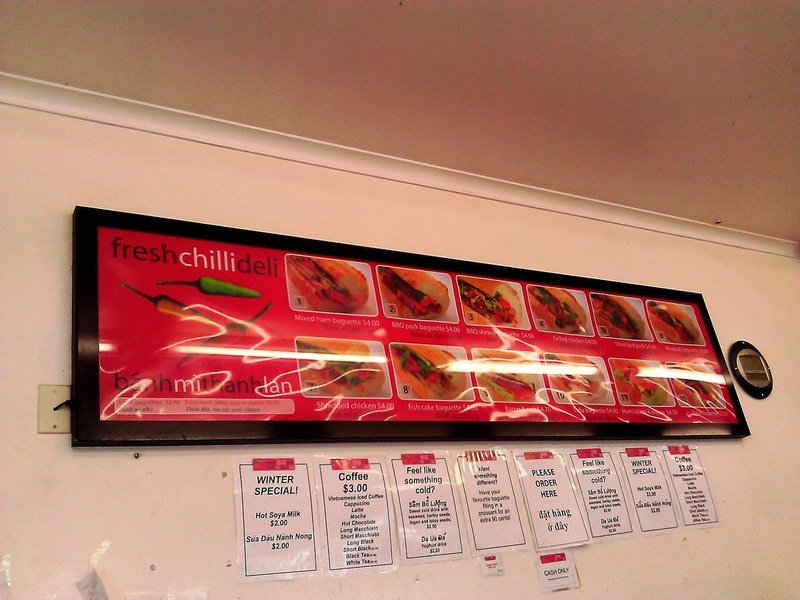 Speaking of laksa - laksa is surprisingly popular in Darwin, and sold at a variety of stores from cafes and restaurants, to food courts and almost at all the markets (from Mindil, to Rapid Creek, to Parap, to Palmerston)! Biryani rice with red chicken and sambal eggplant - same deal as the dish above. 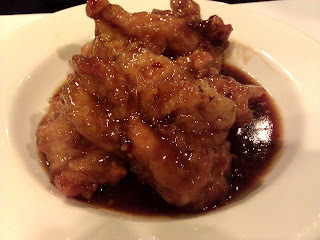 Red chicken was soft, with plenty of meat, and with a pleasant sweetish, tomato-tasting sauce. Slippery soft texture of the fried eggplant (hard to get it wrong!) was nice. Ipoh kuay teow soup with steamed chicken - the pictures above and below are from this same dish. 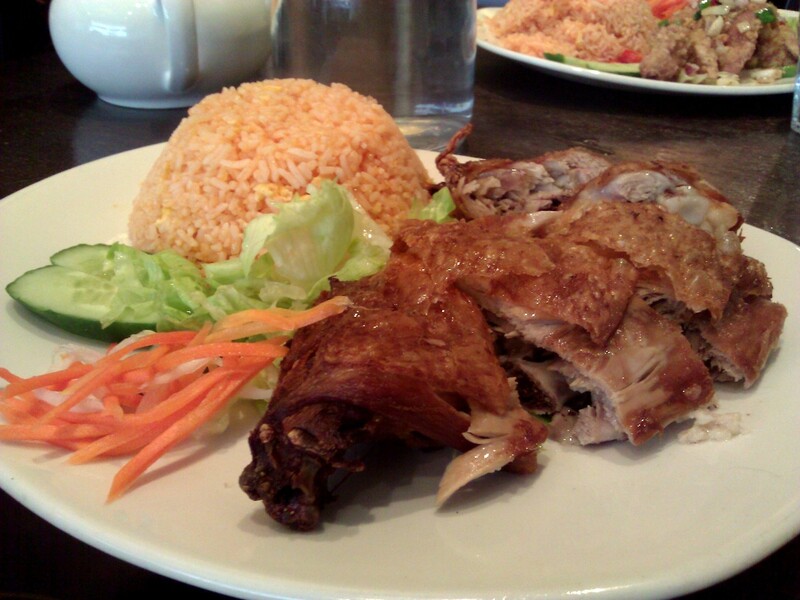 Basically this is your chicken rice dish, with noodles. Chicken was disappointing, and not as tender as it looked. Not sure I like plain soup noodles that much, but it did taste like a healthy option if that's what you're going for! I insist that overall, Melbourne is better than any other city I've been to for food. Looking at this though, I have a sense of nostalgia towards the countless less than $3 perfect slippery chicken pieces which washed down so well with chicken rice and chilli, or porridge, at the NUH staff canteen. My colleague had the same chicken rice there for a month when he first lived in Singapore, then boycotted the dish altogether from his diet haha. 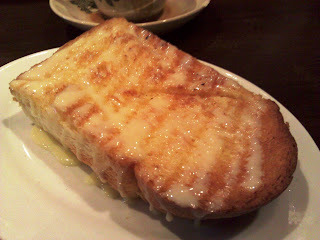 Hainan toasted bread with condensed milk - really liked this. A thick slice of fluffy soft bread, golden and crunchy on the outside, dipped in condensed milk. Wouldn't mind coming back for their breakfast-style meals on another occassion. 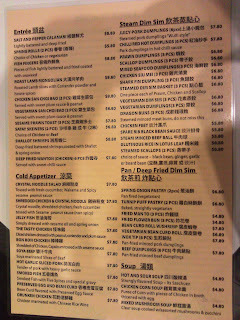 Other: I quite like the menu at PappaRich with description of featured dishes, and the large colourful pictures. Seating both indoors and outdoors are comfortable. The ordering system takes a bit of getting used to, because you write orders yourself, press a buzzer, and hand the piece of paper to the attending waiter or waitress. Oh, they seem inflexible with varying orders, but then, orders come out with surprising efficiency too. Rating: 3.5/5 some average dishes, but there's enough yummy items on the menu to keep me happy and returning. I return more often than I think the food is worth, simply out of convenience - what a great, central location for a meal or snack at any time of the day! 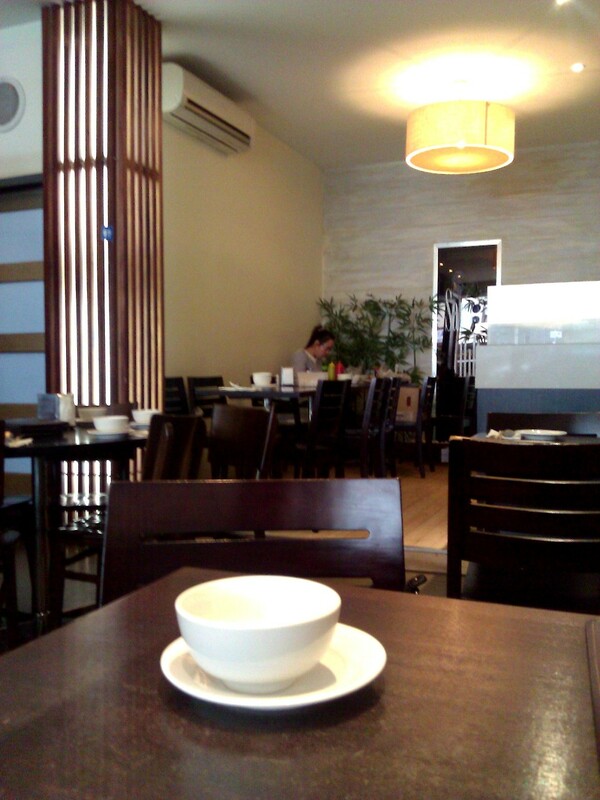 Peak hours are noisy, with chairs too close together, but overall it's a comfortable casual dining environment. 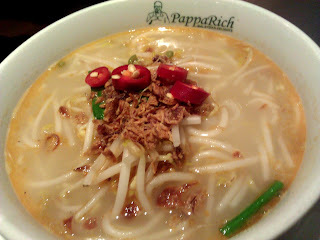 Would be interested to know more too, about what the PappaRich franchise stores in Malaysia are like. A not very posh pre-theatre / pre-musical dinner, and an always much loved (yet increasingly rare) occassion of dining with my best friends from school. What's with the name? Well, Wikipedia has an informative article about "mamak stalls". Didn't realise that there was a particular name for this type of establishment, serving a standard menu of different sorts of roti, mee goreng, teh tarik and its variations - I guess the Cheese Prata Shop I wrote about was a mamak stall too! Website: I'm impressed that they have an official website which is rather informative. For a restaurant which seems to have been open for barely a month, it certainly has a lot of "blogger" and "critic" reviews on Urbanspoon! 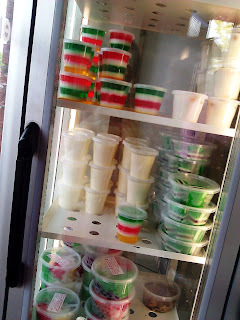 Price: $3.50 drinks, meals for $10-$15 per person. 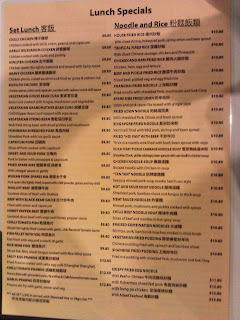 Full menu available on their website - plus points for saving me the bother of taking shaky menu photos! Limau ais (fresh lime with syrup on ice) - on the left, in the photo above. Felt that this tasted like, and was as sweet as, flat Sprite. Not sure the drinks at Mamak are worth $3.50 for these small glasses - I prefer to save the change for a Chatime bubble tea down the street. Teh ais (ice milk tea) - on the right. Strong tea flavour, pleasantly sweet, but unremarkable. Is teh ais how this is usually written in Malaysia? In Singapore, I had always seen it as "teh ice" or "teh ping" on menus. You don't want to see how much condensed milk goes into making this drink. It's a fantastic drink on a hot summer day, which probably means it's less nice on a cold and rainy Melbourne day. Satay chicken - $16 for a dozen. Singaporean/Malaysian styled satay is something I never got into. Partly because the minuscule pieces of meat just isn't filling, and partly because we had it so often with catered lunches at the hospital. The meat here was tender but lacked a smoky, grilled flavour. Sauce was sweet, mildly hot, and quite nutty, with lots of crunchy peanut bits to chew on. My friend really enjoyed the sauce and used it as a condiment to everything else too. At least Mamak could be more generous with the vegetables. And doesn't satay usually come with compressed rice cubes (nasi himpit)? Overall it was just not worth it, and we wouldn't order it again. Roti pisang (banana roti) - $7.50. It was interesting how you could choose for the sweet roti to be served "traditionally with curry or enjoyed as a dessert with ice-cream". The sweet banana flavour was lovely, and the roti itself was reasonable, but not crispy enough. The left hand side was a dhal curry, and right hand side was a rather hot curry sauce which tasted creamy, perhaps with blended cashew nuts (but other reviewers said it was fish curry, maybe I should have asked exactly what it was). Murtabak - "filled with spicy meat, cabbage, eggs and onions" ($11.50). Basically it was the same dish except with stuffed mince meat instead of bananas. The filling was tasty enough, but again the roti lacked any crisp. Even with a solid layer of stuffing, the outer parts shouldn't be soggy, but it was! Nasi lemak - $11.50. There are several options for the main meat you want to add to the dish, I chose curry chicken. 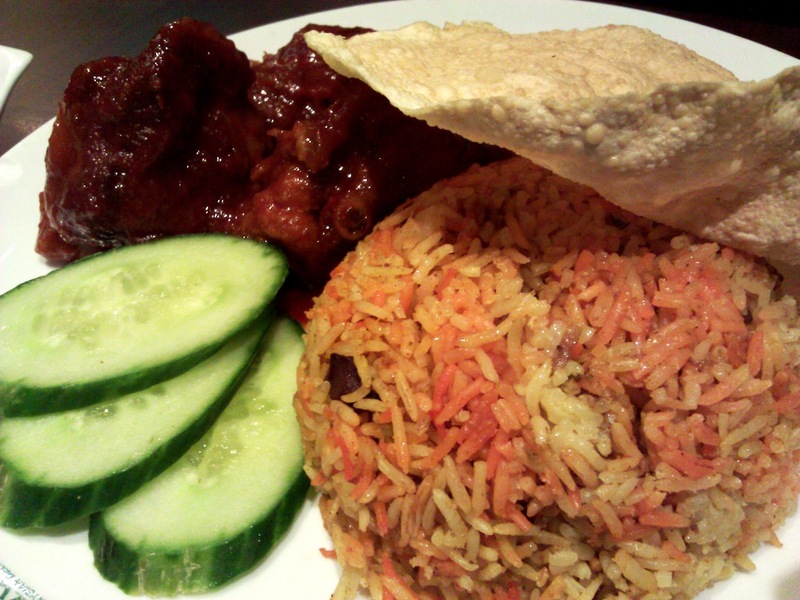 Nasi lemak is a common dish in Malaysian/Singaporean cuisine. Memorably, I first had it at Nasi Lemak House in Melbourne, and hated it. Gave it another shot at Changi Village in Singapore, and still wondered what the fuss was about this dish which basically consisted of rice, a lump of chilli and a single small fried chicken wing. The most basic version I had was one from a roadside stall in Malaysia, where all the brown paper wrapping contained, was a ball of rice with sambal chilli - interestingly, by then I had come to enjoy this simple but tasty dish. Literally, the name translates to "fat rice", referring to the coconut milk which the rice is cooked in. Locals tell me that a good fragrance for the rice is the key element of the dish, which is a bizarre concept because rice usually accompanies a dish. As for the dish at Mamak - the rice had a coconut fragrance, but it was mild and easily overpowered. 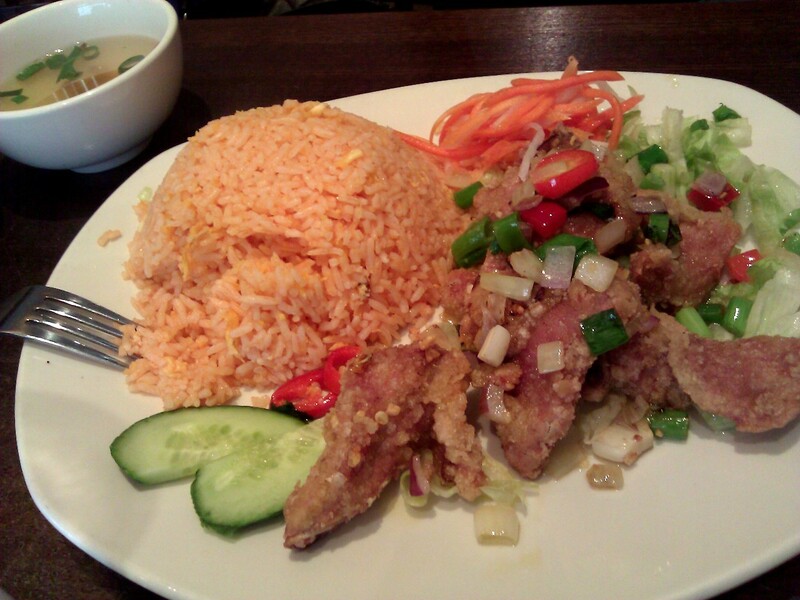 The grains were unevenly cooked, and the rice was served warm but not hot, which I dislike immensely. The chicken was soft and nicely cooked but there was actually very little meat and much bones and cartilage. The sambal chilli had a decent flavour, but wasn't hot at all, and there was barely enough to go with the rice. I liked the peanuts and anchovies (ikan bilis) though; they were crispy and not coated in salt. Rating: 2/5 we wondered why Mamak, being "talk of the town", had a low rating of 58% on Urbanspoon. Now I feel that the rating is well deserved. Having a small targeted menu is good, but for a place which is supposed to focus on good roti, the roti is soft, flat and generally unimpressive. The roti canai, which we didn't order this time, looked yummy though. Also, the food was overpriced. It's acceptable to pay an inflated price of say $10 for a nasi lemak in Melbourne, but for that price, you can't provide a serving size as small as the ones in Malaysia/Singapore! For Malaysian food in Melbourne CBD, I prefer Papparich at QV (but haven't had the exact same dishes there so can't compare directly). Or we could avoid these places altogether, and wait for the trip to Asia!